On September 10, 2007, Labrador Iron Mines Holdings Limited entered into a merger agreement whereby in consideration of the issue of an aggregate of 24 million common shares, it acquired a 100% interest in the Schefferville Project. 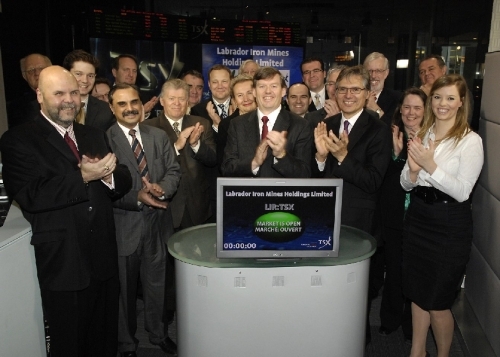 On December 3, 2007, the Company closed an Initial Public Offering (IPO) through the issue of 11,473,000 Units for gross proceeds of $45,892,000. On January 8, 2008 the Agent in the Company's IPO exercised its over-allotment option and the Company issued a further 1,720,950 Units for additional gross proceeds of $6,883,800. In total, $52,775,800 was raised through the IPO. During the period from September 2005 to December 31, 2007, LIM through its wholly-owned subsidiary, Labrador Iron Mines Limited, conducted extensive exploration and development work including geological evaluation, sampling, geophysical surveys, trenching, drilling, bulk sampling, resource verification, assaying, metallurgical test work, preliminary mine planning, community consultation, transportation studies and other work. Following the IPO, the Company undertook a program of verification drilling and bulk sampling on certain of the properties to produce a compliant mineral resource, leading to the undertaking of a detailed engineering study of mining the hematite deposits to produce direct shipping lump and sinter fine ore, which will require minimal processing. Over the ensuing period, the Company expanded its management team and operating team with a number of senior appointments, initiated further activities to advance the developmental stages of the Project and awarded various contracts, including environmental baseline studies, detailed exploration drilling, bulk sampling, resource estimation, metallurgical process testing, rail and port studies and engineering design. In December 2009, LIM acquired control over an additional 50 million tons of DSO properties in the Province of Quebec, together with a large package of mineral claims in the Schefferville area considered prospective for iron ore and manganese. The properties are all located in the Schefferville area and in the same general vicinity as LIM's DSO iron ore operations. The acquisition brought the total number of DSO iron ore inventory to 150 million tons. The Quebec-Labrador iron range has a tradition of mining since the early 1950s and is one of the largest iron producing regions in the world. The former direct shipping iron ore operations at Schefferville (originally known as Knob Lake) operated by Iron Ore Company of Canada (IOC) produced in excess of 150 million tons of lump and sinter fine ores over the period 1954-1982. Written references to mineral occurrences in the Schefferville area of Newfoundland and Labrador (and Quebec) were first included in the diaries of missionary Louis Babel in 1854, based on which Albert Peter Low (A.P. Low) of the Canadian Geological Survey (CGS) began detailed mapping of the area in 1892 and continued the work in 1895/96. During that period, Low published a report which highlighted the existence of large iron ore deposits in the area. The Labrador Trough was largely unexplored until the late 1930s when the first serious mineral exploration was initiated by Hollinger North Shore Exploration Company (Hollinger) and Labrador Mining and Exploration (LME). These companies were granted large mineral concessions in the Quebec and Labrador portions of the Trough. Initially, the emphasis was on exploring for base and precious metals but, as the magnitude of the iron deposits became apparent, development of these resources became the exclusive priority for a number of years. LME began exploration in the area some time around 1936, and was subsequently taken over by Hollinger which was later joined by M.A. Hanna Company (M.A. Hanna). Under the direction of Hollinger and M.A. Hanna, an intensive exploration program was undertaken in the Schefferville area between 1945 and 1949. With the involvement of those two companies and a number of other entities,IOC was officially incorporated in 1949. During the period between 1950 and 1954, IOC constructed the 565 km rail transportation system between Schefferville and the shipping and receiving port of Sept-Iles - known as the Quebec North Shore and Labrador Railway (QNS&L). Headed by Bill Durrell as General Manager of Construction, the QNS&L was built to service the new iron mines in Labrador and Quebec, the timely completion of which was recognized as one of the great engineering feats in Canada (G. Webster, The Prospectors' Pick). A power station was also established at Menihek, in addition to processing and maintenance support facilities at the mine site. Sept-Iles sits on a circular bay with its entrances protected by the seven islands that gave the town its name. Early economic activity in the Sept-Iles area was based on fishing and the fur trade, and later, forestry and eventually mining. During the construction by IOC of the QNS&L, Sept-Iles underwent a rapid growth phase. IOC commenced operation of the open pit mines in Schefferville in 1954 and exported the direct shipping product which contained between 56-58% Fe to steel companies in the United States. Mine workers were originally accommodated in the near-by temporary town of Burnt Creek. Permanent housing and office accommodations were subsequently constructed in the town of Schefferville, following the start of ore production activities. The population of Schefferville subsequently grew to a total of about 4,500 persons during the peak mining years until operations were terminated in November of 1982. At the time of closure, a resource of approximately 250 million tons of iron ore remained in individual deposits in Labrador and Quebec, located in proximity to the previously operated mines.